Do you ever wonder how many pets are never seen by a veterinarian because clients are unable, or choose not to go through the stress involved, to bring them into a veterinary practice? Consider the role of the veterinarian who makes house calls, especially for cats. Although pet cats outnumber dogs in the U.S. by 15 million, it is estimated that only half as many cats as dogs are presented to veterinarians. In this interview, Karen Fine, DVM, CVA, shares her experiences as a house call veterinarian. Dr. Fine graduated from Tufts University School of Veterinary Medicine and opened her own house call practice—Fine Veterinary House Calls—based in Worcester, Massachusetts. Dr. Fine is certified in veterinary acupuncture and mentors many veterinarians in this discipline. Her special interests include holistic treatment of geriatric conditions and cancer. What motivated you to become a house call veterinarian? My grandfather was a physician who performed house calls as part of his practice in South Africa; his career planted the idea of eventually having my own house call practice. When my grandfather died during my senior year of veterinary school, I inherited his doctor bag and ophthalmoscope, which I still use today. I soon discovered that I loved small animal medicine, but after a rough start as a new grad, which involved working in two troubled practices, I decided to try a combination of home visits and clinic work. Twenty years later, I am very happy with this combination and continue to work part time at the wonderful Central Animal Hospital in Leominster, Massachusetts. What are the benefits of a house call business, both for yourself and your clients? One of the main benefits for me is flexibility—I have control over my schedule! I also really enjoy the close relationships I’ve developed with my clients and patients. In fact, I have several subsets of clients, such as those with elderly or fearful cats, multiple animals, and reactive dogs. I’ve taken on patients that typically seizure at a clinic or have diarrhea in the car. Also, people who cannot drive appreciate the independence that home visits provide. My clients often say, “I don’t know what I’d do without you,” and “You make this so much easier for me,” which is greatly rewarding. Home visits enhance my ability to assess each patient’s lifestyle and quality of life. Rather than clients telling me what color bags their pets’ food comes in, I can see firsthand what and how they are feeding their pets. I also observe important things in the home environment; for example, Peanut the Shih Tzu, whose owner called because the dog was urinating off his normal newspapers. When I arrived, I noticed an enormous new planter right next to the newspaper, dwarfing the poor dog. We moved the planter, and Peanut immediately went over and urinated on the newspaper. What are the biggest challenges related to developing and maintaining a house call business? Someone once told me that the currency of a house call practice is time, and I find that to be true. It is a definite challenge to speak to every client myself, book every appointment myself, and do all my own paperwork. Some house call practitioners have support staff, but I grew my practice slowly and became accustomed to doing everything myself. Keeping things small allows me to maintain flexibility for both myself and my clients, but there are times I miss the support staff of a clinic. What are the major differences between having an office site and working from clients’ homes? One of the main differences is the naturally slower pace of working at kitchen tables or in living rooms. It takes time to adjust to different settings, and it doesn’t work for everyone. I am not in control of the environment, but must still stay focused. What helps is that I have known many of my clients for years and, therefore, know what to expect in their homes. How has becoming a house call veterinarian allowed you to grow your practice in ways you may not have pursued otherwise? 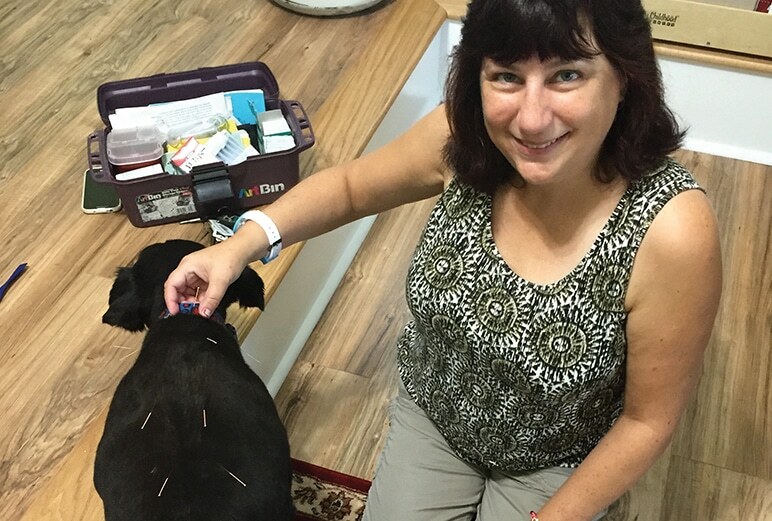 Acupuncture has been a wonderful addition to my house call practice. I see patients more often, sometimes weekly, depending upon the situation. I have also become a referral practice, as I have some clients who see me only for acupuncture. Stay tuned for discussions in our Practice Building column on implementing complementary medicine, hospice care, and geriatric services in upcoming issues of Today’s Veterinary Practice.